3. In recirculating systems, pH should be checked on a daily basis because the uptake of water and nutrients causes pH to change (Fig 10.2). It is best to adopt a pH maintenance regime that helps prevent pH from getting too high. If pH is left too high for a long period of time, the resultant precipitate is usually not easily re-dissolved (Fig 10.1). 2. Supply at least 10 litres (2.5 gal) of nutrient for each large plant. Failure to do this will magnify pH (and EC) fluctuations, especially during hot and dry weather when water uptake and evaporation are both excessive. To avoid excess water uptake and high evaporation rates, keep the air temperature below 30OC (86OF) and relative humidity above 50%. Step 1. Measure the pH: Use either a liquid pH indicator or an electronic pH meter. 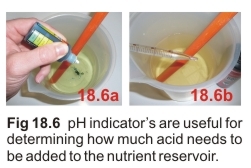 Before measuring the pH, ensure that the nutrient is well stirred and that the sampling container is clean. ● If your pH tends to continuously rise (the most common trend), then at each adjustment, reduce the pH to about 5.0 using pH Down. This will give you a much larger pH "safety" margin than, for example, 5.8. ● If pH tends to fall, at each adjustment increase the pH to about 6.0 using pH Up. Adjusting pH by trial-and-error can be tedious, especially for large reservoir volumes. Refer to Note 1 below for an alternative method. Do not pre-adjust the pH of raw water before adding nutrient unless the make-up water has high alkalinity. If you do attempt this procedure, because natural waters have a low buffering capacity you will typically get wild pH swings either side of the pH target without ever landing on the target value. 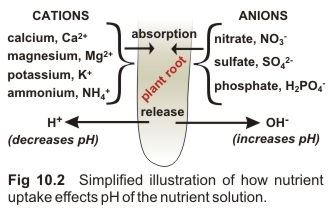 Note that the pH values being discussed in this chapter are the values of the working nutrient solution - not the make-up water. # 1. Take a 1.0 litre sub-sample (or known volume) of working nutrient (“S1”). # 2. Add a few drops of pH indicator (Fig 18.6a). # 3. While stirring this solution, measure (“titrate”) the volume** of acid (“T1”) required to turn this solution yellow (Fig 18.6b). ‘Yellow’ indicates ~pH 6 with most broad range liquid indicators. ** If this volume is very small (most likely if a highly concentrated acid is used), you will require the use of a finely graded pipette to ensure accuracy. A better method is to prepare a portion of acid specifically for conducting this estimation. Thus, dilute a portion of the strong acid 10-fold with tap water and titrate using this diluted solution. Ensure to compensate for this dilution when calculating how much of the concentrated acid to add to the reservoir.